Whether you want to send your wellness wishes to a recovering friend or encourage a loved one to live a healthier, happier life, Gift Prose has a huge variety of Get Well Gift Baskets to choose from. Recovering from an illness can be a difficult time in anyone's life. 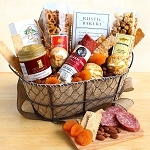 Make their day a little happier and brighter with these thoughtfully put together gift baskets. 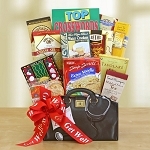 These cheerfully decorated gift baskets include everything your loved one will need to recover fast. 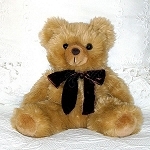 From delicious cookies and chicken noodle soup to get well plush toys and puzzle books to keep them occupied, every gift baskets includes thoughtful items that will show your loved one how much you care. Our Wellness Wishes Gift Basket is a gorgeous basket that will pamper a friend or family member. It is includes a book with uplifting stories of personal triumph, feel good snacks like caramel corn, crackers and biscotti, herbal tea, aromatherapy candle and much more!